Community Rehabilitation Hospital North, located on the Community Hospital North medical campus, is an inpatient facility that offers superior access and the latest equipment to improve the lives of individuals with a broad range of diagnoses - from brain and spinal cord injury to stroke and amputation. Community Rehabilitation Hospital North has an advanced accreditation from the Commission on Accreditation of Rehabilitation Facilities (CARF) in Adult Inpatient Care and for their Inpatient Brain Injury Specialty Program and Stroke Specialty Program. Community Rehabilitation Hospital North has also earned The Joint Commission’s Gold Seal of Approval® for Amputation and Stroke Certification. The Gold Seal of Approval® is a symbol of quality that reflects an organization’s commitment to providing safe and effective patient care. It is the first and only rehabilitation hospital in Indiana to earn the amputation certification. Maintained in partnership with Kindred Healthcare, a national leader in the development and operation of rehabilitation hospitals, the 63,000 square foot facility has 60 beds and serves as a Midwestern regional provider for patients with complex physical and neurological injuries. Please call Admissions at 317-585-5413 to arrange a visit and tour of our facilities. Watch the video below to learn more. For general questions or additional information about the services available at Community Rehabilitation Hospital please call 317-585-5400. While getting the best possible rehabilitation care is the first priority for patients, convenience is an important consideration for families who want to be close to their loved ones. With more than 100 hospitals in seven states referring patients to us, we are a regional destination for high-quality rehabilitation care. Community Rehabilitation Hospital North, within minutes of I-69 and I-465, is easily accessible to patients and families throughout Indiana and the Midwest. 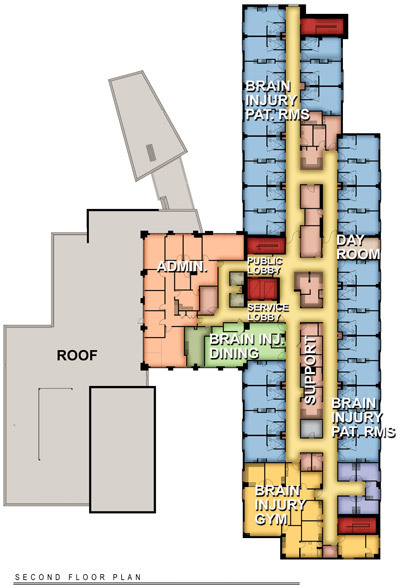 The hospital is also close to major arteries leading to downtown Indianapolis, and offers free parking. All inpatients at Community Rehabilitation Hospital North are provided with a private room for comfort and privacy. The custom-built building enhances patient outcomes and provides the rehab team with access to the best tools in the area to deliver these services. Learn why inpatient rehab may be a good fit for your recovery at brochure.myrehabviewer.com/Community-Rehabilitation-Hospital. This video also explains why inpatient rehab may be right for you. Explore more videos on Your Stay: What to Expect. Our team is excited that you have chosen Community Rehabilitation Hospital North and wants your stay to be as comfortable as possible. We are different from a typical hospital, so we want to tell you a little about our program, our facility and what you can expect during your stay. If you have any questions about your stay, please call us at 317-585-5400. Our goal is to provide excellent service. If at any time we have not met your expectations, we want to know. If you have questions about your experience or suggestions for making it better, please contact the Director of Quality Management at 317-585-5411. Community Rehabilitation Hospital North offers free monthly support groups for patients, families and caregivers dealing with spinal cord injury, stroke and amputation. Support groups encourage sharing of common concerns and goals in an atmosphere of camaraderie and friendship. In 2018, Community Rehabilitation Hospital North served 1,418 patients - including 262 brain injury patients and 350 stroke patients - while providing three hours of skilled therapy per day, five to six days a week. 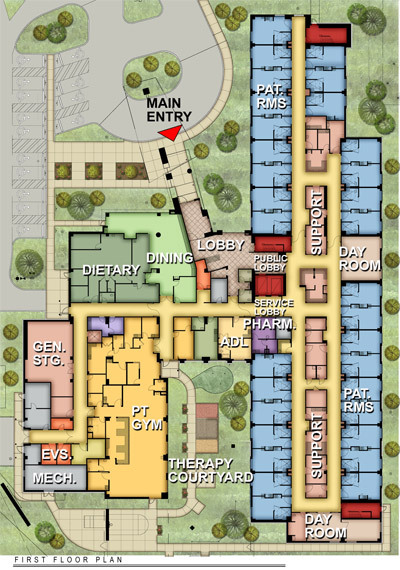 Find your way around Community Rehab Hospital North with our handy maps. Learn more about inpatient rehabilitation programs at Community Rehab Hospitals.